This week in Storybrooke: Zelena is not a good friend in the past, Zelena tries to be a better friend in the present, and everyone else explores wedding venue options for Emma and Hook. Which, for such a magical bunch, are pretty limited. Pushing the tables over at Granny’s? So, sending everyone to the Enchanted Forest kind of makes sense: Destination wedding! Man, is the Black Fairy’s evil laugh horribly fake. Latest victim of OUAT’s cruel hairstylist: Belle. I feel like we’ve seen Zelena suffer for her wickedness before, and as fun as it was to see her in the green makeup again, this was still a complete treading-water episode. 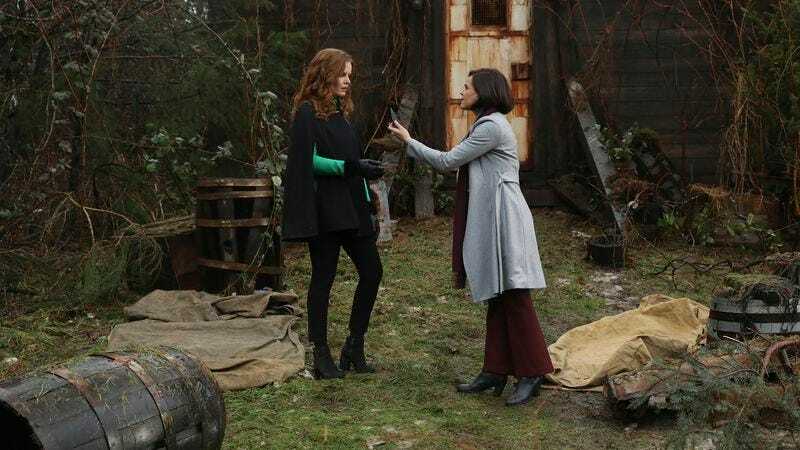 And now what is Zelena supposed to do in Storybrooke without any powers? And just how long is Robin going to stay an infant? And now that they’re awake, why don’t Snow and Charming get baby Neil out of the nunnery or wherever? This show should not have babies if it has no idea what to do with them. Except to make them instant adults. Black Fairy’s tease about her deepest, darkest secret was right out of a soap opera from the 1960s. Still, it gets us to next week, then the wedding, then the battle, then who knows? See you then!